Lamb dressed as Mutton: New year's resolutions? Not for me! *Sings* Christmas is over, Christmas is over, hooray hooray hooray! Don't get me wrong, I actually quite enjoyed Christmas this year (don't tell my family) but I'm still glad it is behind us. We have the new year to look forward to now. A fresh start. That's my positive angle on the whole new year thing. The negative one, is that it's just another day so calm the fudge down. So don't go and join the gym, or go on a diet (you can only do those on Mondays anyway) just act normal! If you want a fail safe way not to do something in 2014, write it down as your New Year's resolution. Before the start of a new year we have oodles of optimism in which we write our resolutions, but soon enough the January blues kick in and we end up depressed due to lack of achievement and self discipline. Have you ever kept a resolution? I think the problem is, a year is too long for the goals we are setting. If you want to make a resolution about weight for example, how are you going to remember what weight you were on the 1st January at the end of the year? And say you want to loose 5 pounds you might do that by February and then put on two pounds, loose four, gain one etc. etc. and by the end of the year you don't feel like you've achieved anything. 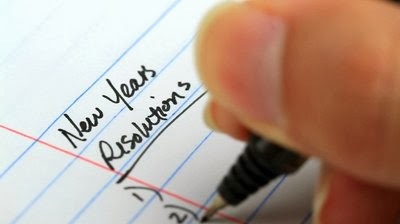 When you think of your new years resolution you need to remember that the goal is a whole year away. It is unlikely that your aim of going to the gym once a week for a year is going to really work. I think it is very difficult to come up with a decent resolution that at the end of the year you can go "I did it. I stuck to my resolution all year". If you can… well done, and if you can without getting punched by your friends… doubly well done! 1) Don't make resolutions in the first place. They are normally made on a drunken whim and you will regret it in the morning but feel you should at least keep it for a day. On January 1st however you realise that becoming the next Maria Sharapova is a lot harder than you first thought because you can't actually play tennis (despite being excellent at the grunting) and you don't like Evian water and once again by January 2nd you've failed. 2) I don't actually have a second point (soz). I was going to say, come up with a resolution that only lasts for a week or a month but how depressing would it be if you can't keep something going for a week? And I'm sure most of us can't, think of all those diets that start on Monday and end on Tuesday. No we can't just shorten the goal. Point two is void. I didn't have a plan when I started this post, I thought maybe whilst writing I would come up with a brilliant answer to the new year's resolution conundrum but alas I have not. What I have done is convinced myself further that they are a waste of time, energy and space. On the 1st January I will not go for a run, eat less or get up early. New year's resolutions, go fudge yourself!